Stampin' Up! Demonstrator Kim Price - Handmade by Kim: Just For You.... Handmade Card created with Sale-a-Bration Freebies by Stampin' Up! Just For You.... Handmade Card created with Sale-a-Bration Freebies by Stampin' Up! I wanted to take the opportunity today to say hello and welcome to all my new subscribers! Thank you so much for subscribing, it means a lot to me and I hope you enjoy looking at the projects I make. Today's project has been made using a free stamp set that I have earned during Sale-a-Bration. You can do so much with this stamp set but I wanted to show you how lovely it can be with this simple design in silver and white. I'll be working on a stepped up version of this card so keep and eye out for this on my blog ! 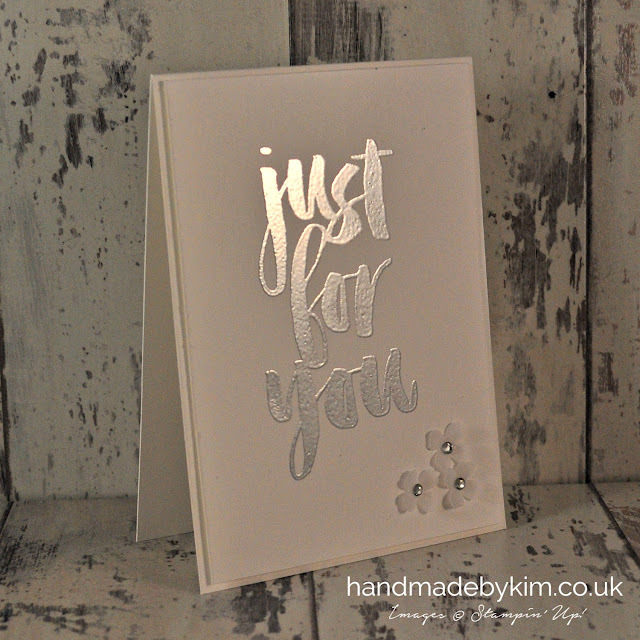 I stamped the sentiment Just For You in Versa mark Ink and used Silver Embossing Power and my Heat Tool to give this shiny silver effect. I punched out some flowers from Vellum cardstock using one of the Itty Bitty Accent punches and added Rhinestones to the centre. Wow...this is gorgeous! Love the simplicity and color of it. TFS! Thanks Julie, I can see you've seen the stepped up version of this too!